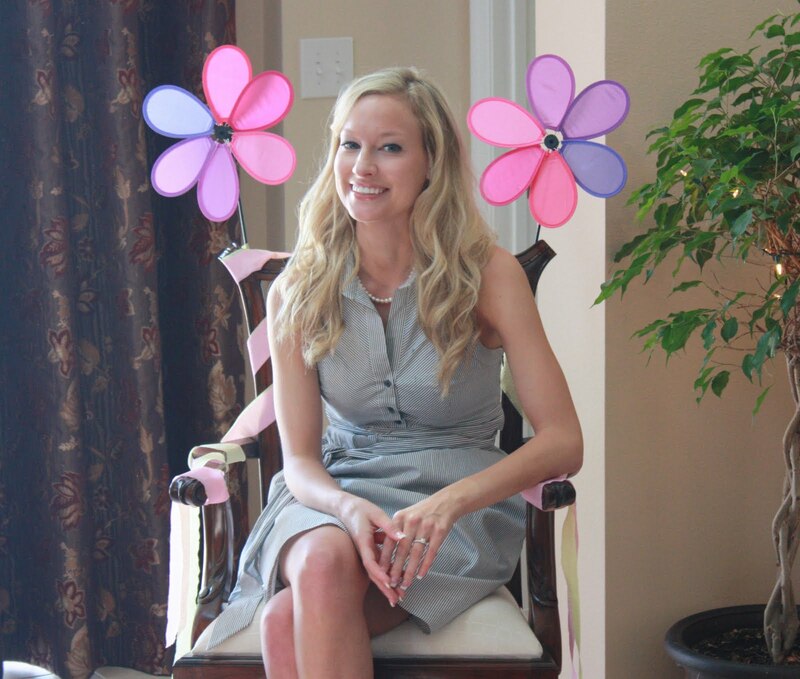 So one of the reason’s why I hadn’t been blogging much was I threw a bridal shower for my sister, Julianne. A couple of you mentioned you’d love to see the pictures so here they are! Maybe it will inspire you to have an Asian themed party. Since my sister worked in Hong Kong and then in Japan, Joy (one of the bridemaids) suggested we have an Asian theme. How fitting. So you’ll notice our theme is Springtime in Japan (thrown in with all of Julianne’s favorite foods and flowers). I labeled all the food on parchment paper, one side in English, the other in Japanese (katakana and kanji) and glued it onto skewers. 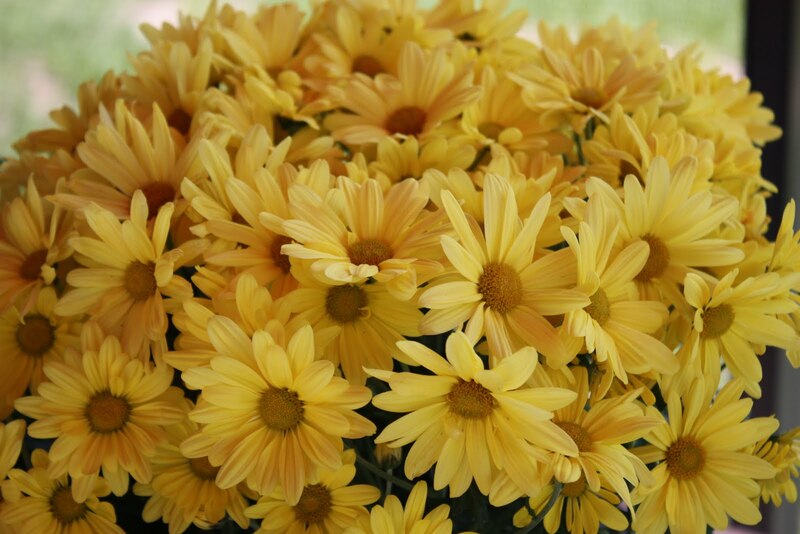 Then I stuck a daisy at the end for extra fun. 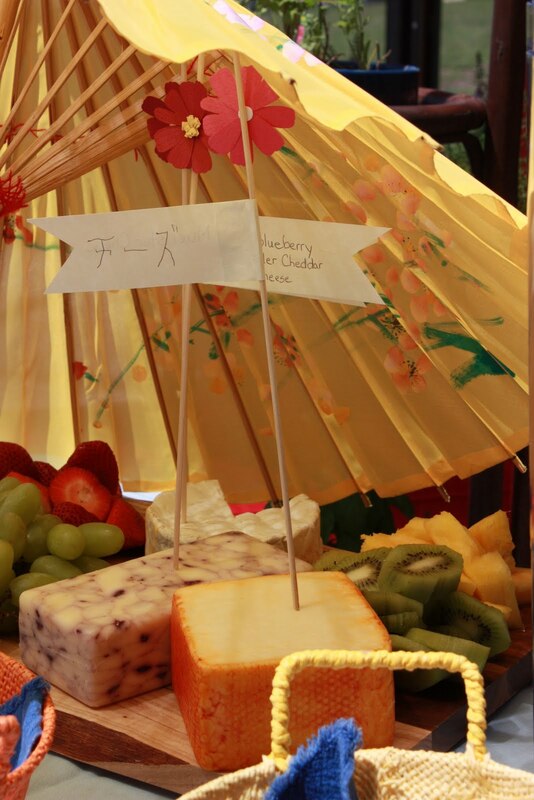 I put the cheese and fruit on a cutting board and a Japanese umbrella over it to protect it from the Florida sun (ironically, I got that unbrella in Korea while pregnant and hiking). 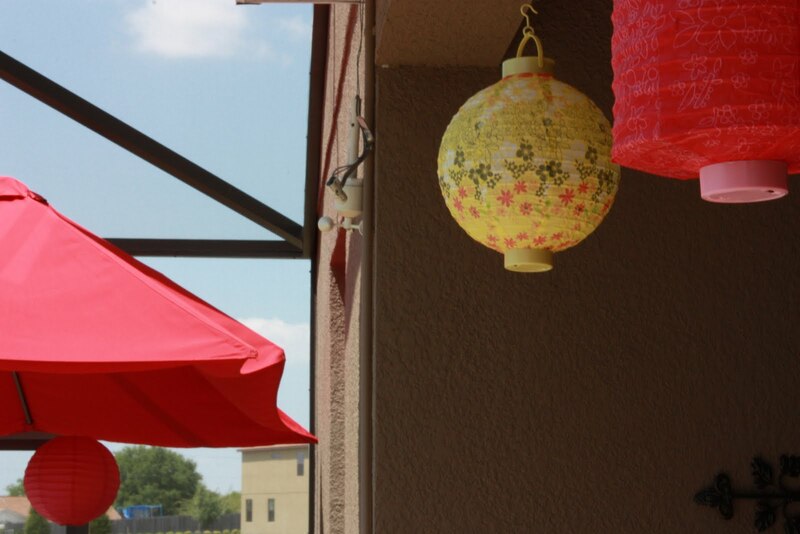 I hung Chinese lanterns that I found on sale at Old Time Pottery and Joann Fabrics inside the house and outside by the pool. The champagne had sprigs of fresh lavender and for the lemonade glasses, I bought them online at Specialty Bottle (they are actually sauce jars!). I got the swirled straw online as well. Then I tied leaf paper cutouts onto the top with hemp. Guests wrote their names on it so their glasses wouldn’t get confused. For food, we had a chocolate fountain (of course!). What is a party without chocolate? We had habachi grills and guests grilled chicken and tuna with skewers over the coals. Yum. 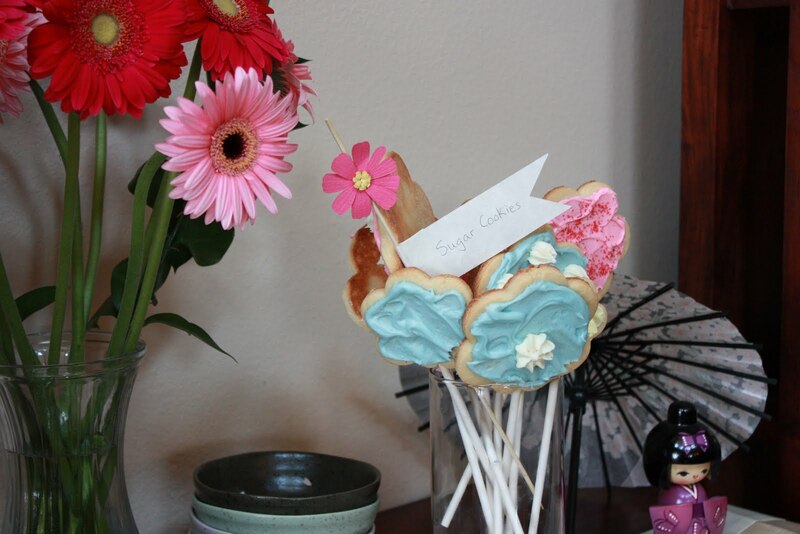 I kind of went overboard on the baking with the cookies on a stick, but they are so adorable aren’t they? The boys loved them. And then, Julianne’s favorite dessert, Red Velvet Cupcakes. I used Paula Deen’s recipe. The frosting is heavenly. When the guests left, they all got a cupcake wrapped in a baggie and tied with yellow ribbon. We of course had games and prizes. Julianne sat in her ‘throne’ to open presents. We had gave her a memory book which made her cry. Thank you to Larissa (she’s a Creative Memories consultant) for coming to my rescue and knowing what to order to make that happen! 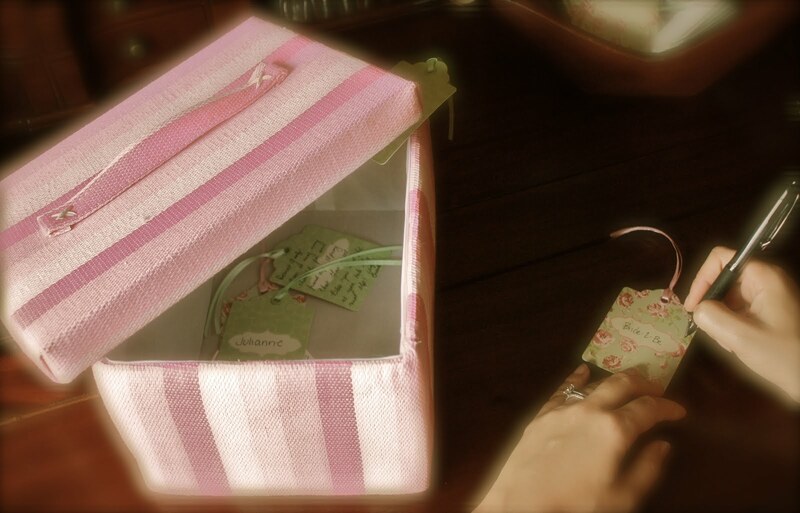 On my desk, guest could also write a message to Julianne with good wishes or advice. It really was an amazing time. I can’t believe my baby sister is getting married! Wow! What a lovely shower, Christy! 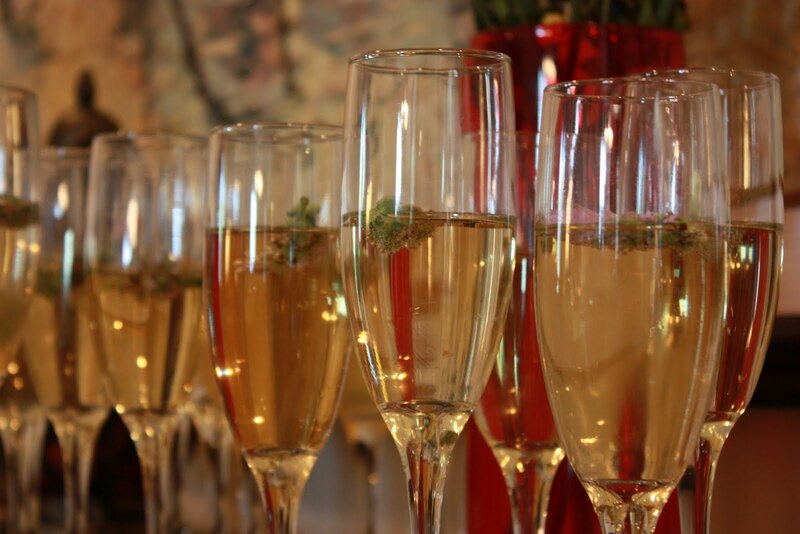 The next time I have a party, I am definitely asking you for some tips! Thanks! But no, I don’t speak any Japanese. I’m just a good pretender. Julianne is the one who’s fluent. Wow-za! That looked beautiful! I want you to plan my next party. By the way, you and your sister are gorgeous. Yes, you’re both stunning and OMG, you can so plan my book party. LOL This looks like so much fun! Aw. Thanks guys. An event planner would be fun. Especially with an unlimited budget! And Victoria, book party planner…hmmm that would be a fun! Looks like a lot of work, but fun! Great job with the decorating!